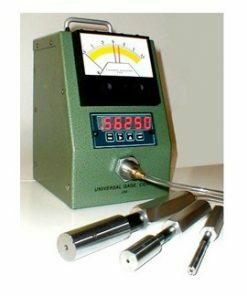 Universal Gage Corporation is a company founded since 1962. It produces and distributes specialty equipment such as air spindles, air bore gages, digital comparators and more. In addition to that, the firm also manufactures tooling that is compatible with most other brands of air gaging as well. Universal Gage Corporation goes out of its way to ensure that their products have the technological edge compared to the competition. For instance, they provide air/electronic comparators with USB 2.0 capability, making it easy to interface the device with another. If you are in the market for Universal Gage products for any application, you should consider getting them from Willrich Precision. Not only do we make it easy for anyone anywhere to buy the products, but we also stock high quality products only so you have no risk of ending up with less than perfect instruments. Unlike other firms, our customer care representatives are trained to understand the products. When you approach them for help, you can be sure that they will provide you with accurate information. Go through our inventory today to find the Universal Gage products you need with ease!